Before Wincor-Nixdorf, there was IBM and Fujitsu, but before them there was the Samkyung Hitech "Weigh and Vend" system. This was trialled for a few months in 2004, at only three locations - Luton (Bedfordshire), Broadgate London, and Alfreton (Derbyshire). These are digitally printed like the present P and G labels, but in a layout which copied that used for the Horizon labels introduced in 2002. 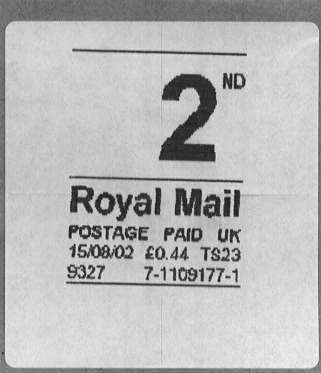 The Alfreton label shown was used in connection with Manchester Postal Museum. We'd be interested in showing any other early labels from the experimental period. What have you got?